I recently spent the weekend in Chicago for a scientific conference (yep my day job isn't all things glassware believe it or not; click here for more details), which was great because it was a somewhat funded trip to Chicago. It also meant I had limited time to explore the local beer scene in a city I hadn't been to since my passion for craft beer really blossomed, but I was able to carve out some time to walk to Eatily and Binny's to do some shopping. 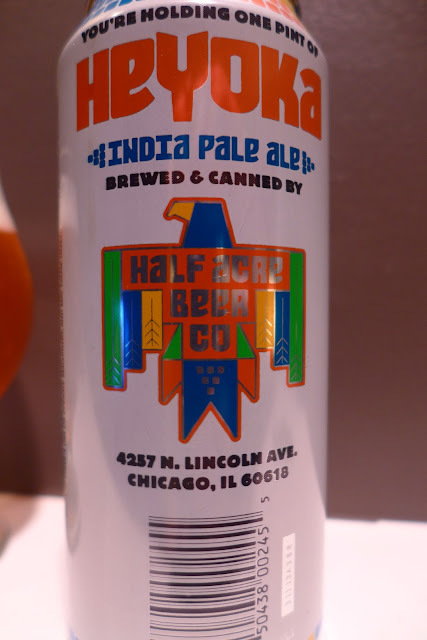 As a result my next few beer reviews will probably be about offerings from Chicago-based breweries. Yes, this is an Indiana themed site, but let's be real: 1) you probably go to Chicago a fair amount and/or 2) you trade with people there. Plus isn't the whole Midwest just a suburb of Chicago anyways? 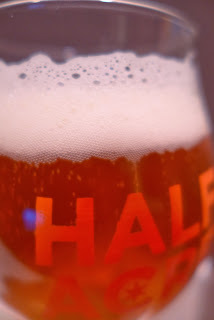 First up is Half Acre Heyoka. Last time I went to Chicago I only knew Goose Island. This was partially because of my lack of knowledge, Goose Island's size, and because a lot of the breweries that now dot Chicago's landscape didn't exist. 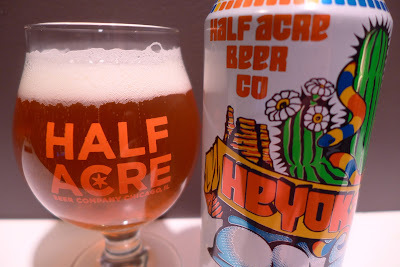 Now when I think Chicago beer, one of the first places that comes to mind is Half Acre and I've enjoyed everything I've had from them, so I picked a couple offerings up including Heyoka. Heyoka is Half Acre's first canned IPA (7% ABV), believe it or not, and is a winter seasonal. According to Half Acre, Heyoka utilizes Chinook and Amarillo hops and a pale malt bill to create what to me is a west coast style IPA. Tasting notes: The beer pours a golden orange with a bright white, one-finger head; laces well. The aromas aren't too strong, but I do pick up notes of grass, pine, and citrus. 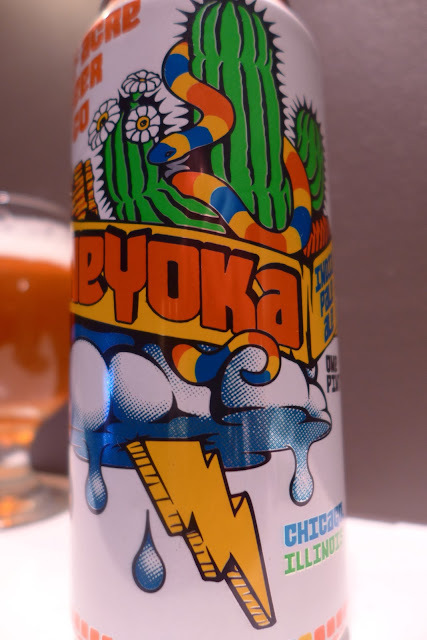 The taste gives off flavors of tangerine, mango, grass, candied grapefruit peel, biscuits, and a good dose of bitterness. The body is light, with soft carbonation, and a pleasantly dry finish.